The Mission Delta III is a flexible distortion pedal capable of a wide range of tones from boost, through TS style overdrive to fuzz. Delta III features a three-transistor, all-analog audio circuit, and quiet, digital switching. A high-quality output buffer ensures compatibility with other pedals making Delta III a fuzz pedal that' usable in just about any rig. The basis of the pedal is a three-transistor distortion circuit. The third transistor forms an output buffer that improves compatibility with other pedals, allowing the Delta III to be used with a wide variety of instruments and signal chains. Unlike many distortion boxes, the Delta III is not overly sensitive to where it is placed on your pedal board and can be used with active pickups, basses, and with buffered pedals. The voltage bias of the transistors has been adjusted for optimal response as the signal decays, allowing smooth distortion sounds even from very high or low signal inputs. The Delta III has two separate EQ controls creating a huge tone-shaping capability. The Lo Range EQ control allows you to fatten up the fuzz tone without getting too flubby. The Hi Range control will let you roll off some of the high end to prevent harshness. Proper adjustment of these two controls allows a very wide choice of sounds from full frequency response to a mid-range lead boost. The Delta III is very touch sensitive, cleaning up with reduced volume or pick attack, and more aggressively clipping as you play harder. It has also been designed to work with the fuzz compatible Mission VM-PRO and V-BOOST pedals in front, allowing you to create pedal controlled variable distortion. Off position “ The pedal behaves as a boost. Use volume and EQ controls to set boost parameters. Mid range “ TS style overdrive and crunch tones. High positions “ Fuzz tones. The microcontroller managed relay bypass system provides soft-touch on/off with fast and quiet switching operation. Engaging and bypassing the effect happens in a few milliseconds. The soft touch switch is much quieter than a typical latching switch, so no nasty clicks and pops when you turn the effect on and off. Digital switching is also much more reliable ensuring your pedal will continue to consistently switch for many years to come. 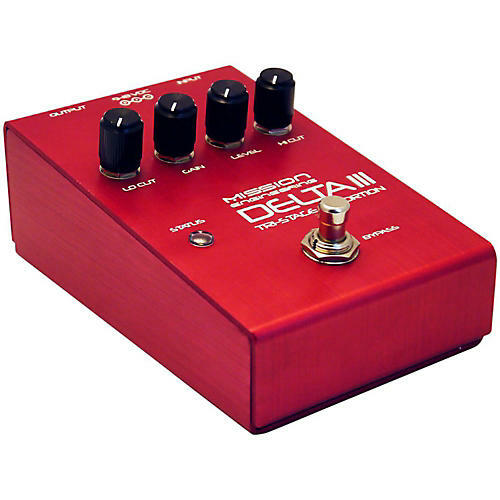 Delta III features a red anodized aluminum chassis weighing just 12 oz., top mounted jacks for easy pedal board setup, four aluminum knobs for volume, gain, Lo EQ and Hi EQ, and a blue status LED. All aluminum construction, weighs just 12 oz. *Measurements at widest points. Not including feet.